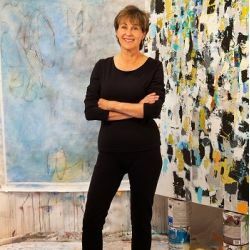 Julie Schumer, a native of Los Angeles, California, now living and painting in Santa Fe, New Mexico, discovered her love of abstract expressionism at age 5. She works in that vein on two series simultaneously. A lawyer for many years, Schumer is self-taught. Her work is shown in various galleries across the United States and is in numerous private collections. Schumer’s unique figures are constructed on heavyweight watercolor paper using a texture material, and multiple layers of acrylic paint and graphite which are applied and then partially removed. The palette is neutral with strategic hits of color. The paintings present as abstract shapes, lines and color that suddenly comprise a recognizable group of figures. They appear to have been uncovered as if discovered at an archaeological site. Given the ambiguity of their identity and gender, they portray timeless and familiar interactions. The universality of their relationships is revealed through their groupings and small gestural cues such as a tilt of a shoulder, curve of the spine or bend of the leg. Schumer also paints large and medium-sized format abstracts in an expressionist and gestural style on paper, canvas and birch panel. These works are inspired by and are reconstructions of the great natural beauty and light of her surroundings in New Mexico and her lifelong travels in the tropics as well as other locations. She starts by introducing color, shapes and line, then responds to their development in an intuitive fashion, layer after layer. Although many of her abstract works are bursting with color, movement and energy, more recently she has worked with a more limited, neutral palette and the appearing and disappearing lines that characterize her figure series, focusing on her own interior landscape, guided by her intuition and emotion.